The Alaskan villages of Kushtaka and Kuskulana sit across the river from each other, but despite their close proximity, they dwell within a great divide, tolerant of each other, but just barely. Kuskulana, inhabited by Christiansons, has always thrived, using modern technology and embracing the changing ways and becoming prosperous; Kushtaka, populated by Macks, is slowly dying out, opting to stay with the old ways of tradition, even if it means poverty and struggling to survive. This conflicting social mirror has caused animosity to ferment for decades and finally comes to a boil when the body of a young Kushtaka ne’er-do-well, Tyler Mack, is found wedged in a fish wheel by another villager, Pat Mack, who eventually contacts state trooper Sergeant Jim Chopin headquartered in Tok. With some help from one of the other villagers—ironically a Christianson by the name of Roger—Chopin eventually manages to retrieve the body. Puzzlingly though, Pat Mack does very little other than watch the other two men struggle in such a tiny, confined space, as Roger’s skiff. After a second murder—looking suspiciously like payback—occurs, the escalating enmity between the two villages can no longer be ignored by Chopin, knowing this latest death could ignite an all-out war. Chopin’s prime suspect is a Kuskulana man already in trouble in both villages for falling in love across the river. But when the suspect disappears, members of both tribes refuse to speak to Chopin, whom they regard as an outside and are apprehensive of his intents. Under no illusions that the villagers regard him with suspicion, the beleaguered cop has little choice other than to call in private investigator and local Aleut, Kate Shugak for help. Kate also happens to be Chopin’s girlfriend. She is a native Aleut (a person from the Aleutian Islands of Alaska and an ethnic cousin to the Eskimo) and ex-DA investigator once working in Anchorage, but now living on a 160-acre homestead known locally as the Park, with her half-wolf, half-husky dog aptly named Mutt. She has been residing in the Park since being badly injured during a fight with a child molester years before, resulting in the murder of her lover. A scar runs across her throat from ear to ear as a terrible reminder of those horrific events. Unfortunately for Kate and Jim, the locals prefer to deal with the killings using their own form of justice, and anyone getting in the way of that justice, better be prepared for all it encompasses, lawmen included. Bad Blood is a modern-day Shakespearian West End Story with very dark undertones of forbidden love, raw animosity, and cold-blooded murder. Despite being 20th in the series, new readers to the Kate Shugak series should be able to jump right in. 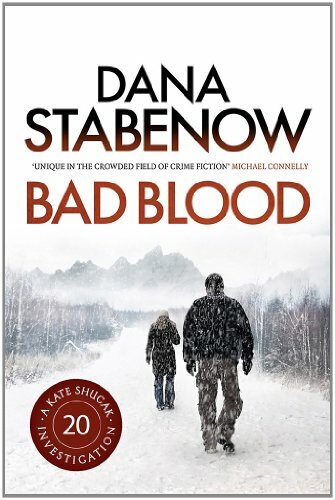 Ms. Stabenow’s natural talent for dialogue and action holds the reader captive to the very end. All this and a cliffhanger to die for—which even the most astute reader won’t see coming until it’s too late.